There are 500 species of salamanders throughout the world, living in a variety of habitats. The first order of business when putting together your pet salamander’s new home is to understand what type of salamander you have. Knowing his full-grown size and natural environment will help you create the perfect salamander habitat. Tiger salamanders are plentiful throughout the United States, which may explain their popularity among salamander enthusiasts. Ranging 6 to 13 inches long, snout to tail, this salamander can be yellow, olive-green or black, often with contrasting spots or blotches, giving him a tiger-like appearance. His perfect habitat consists of either a plastic or glass container with a tightly fitted top – with multiple air holes, of course. A good rule of thumb for determining the size of habitat should be 10 gallons per tiger salamander. Moist coconut fiber bedding, top soil or “forest floor” soil mix are ideal natural substrate choices. His substrate should be at least 4 inches deep and changed out every month or two. His container shouldn’t exceed 72 degrees Fahrenheit. The fact that spotted salamanders are hard to come across makes them alluring for some salamander fans. They’re found naturally through a large portion of the eastern U.S., however, some local areas have laws against removing them from their natural habitat. In captivity, a 10-gallon tank will accommodate one or two of these fellows, who average about 6 or 7 inches in length. 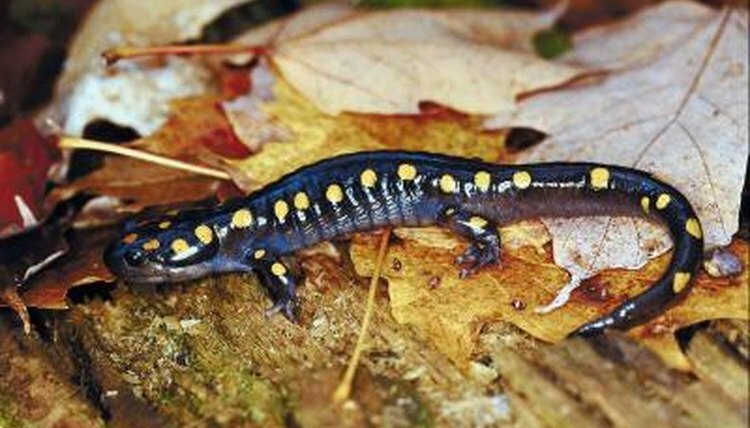 Spotted salamanders are natural burrowers, preferring to pass their days underground, so their habitat must have enough substrate to accommodate their subterranean ways. Damp top soil, sphagnum moss and coconut fiber are suitable choices for substrate. Like tiger salamanders, these guys need a cool environment, ideally ranging between 55 to 65 degrees Fahrenheit. Marbled salamanders are found in a variety of habitats in the wild, from moist gravelly areas to dry hillsides to spots near ponds and streams. Though they can burrow in loose substrate such as soil, these do well in a habitat with moistened unbleached paper towels, changed once a twice a week. Crumpled up paper towels, moistened with dechlorinated water, provide attractive crevices for hiding. Marbled salamanders should have a temperature between 65 and 75 degrees Fahrenheit. Seal salamanders also thrive with a paper towel substrate, however, a temperature in their habitat above 75 degrees Fahrenheit can have lethal consequences. Junaluska and two-lined salamanders are small – around 4 inches long – and several can share space in a 2.5 gallon tank. However, these amphibians need about an inch of water in their tank, as well as land space to accommodate salamanders who aren’t entirely aquatic. Sand is the substrate of choice for these species, and water temperature should hold steady at 68 degrees Fahrenheit. While the temperature, size and composition of habitat varies according to the kind of salamander in your care, there are some “rules” you can apply no matter what kind of salamander you have. Avoid distilled water, untreated tap water, sterile water or de-ionized water. Bottled spring water is a safe choice, or use a product designed to remove chlorine and chloramine from your local tap water. The water should have a pH between six and eight. Substrate such as wood chips should be avoided, which can be too dry. Also avoid strong-smelling substrate or anything containing chemicals that can harm your salamander and irritate his skin. Hiding spots are important, so include driftwood, broken clay pots or manufactured caves found in pet stores. Finally, a dirty habitat can make salamanders sick, so clean water dishes daily and keep up with poo! Can Salamanders Live With Fish?